Beautifully renovated Historic Oceanfront Home. Living room has fireplace , original knotty pine vaulted ceilings and nice big open floor plan overlooking the oceanfront. There are 2 steps into the courtyard and no steps into the house. There are 3 of the 5 bedrooms on the entry floor along with 2 full baths. There is 1 king bedroom, 3 Queen bedrooms & 1 twin bedroom. Kids love playing in the loft (finished attic space off the twin bedroom). Enjoy a perfect panoramic view of the sand and surf throughout the home. Kitchen is fully stocked for preparing a big meal . 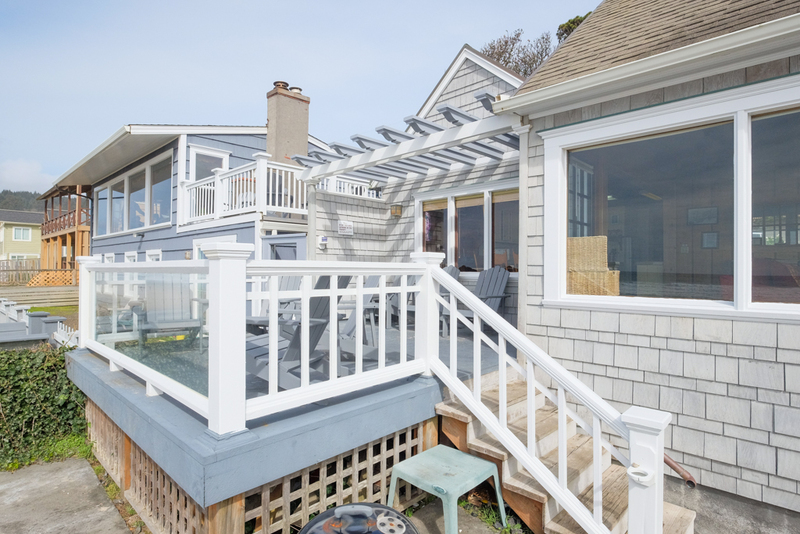 Deck overlooking the ocean with private stairs right down to the sand and a close walk to tide pools. Sun room with wicker furnishings and patio are great for coolers, bikes, etc. There is a beautiful hike that takes off at the end of the street to the North. The path is approx 1.5 miles walking through old growth firs and scenic views of the oceanfront! Wear boots unless it's Summer. Summer 2019 has a 5 nt minimum (unless filling a gap).